← What’s the price of 5086 aluminum alloy plates in the market? 1, the general tread aluminum alloy plate: 1060 aluminum plate for the plate from the processing of aluminum alloy pattern plate, able to adapt to the normal environment, low prices. 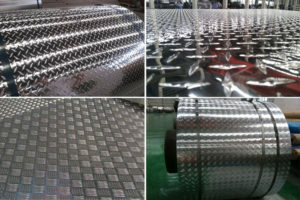 Usually cold storage, flooring, packaging and more use of this pattern aluminum sheet. 2,Al-Mn alloy tread plate: 3003 as the main raw material processing, the aluminum plate, also known as rust-proof aluminum, the strength is slightly higher than the ordinary aluminum alloy pattern plate, with a certain anti-rust properties, but the hardness and corrosion resistance Less than 5,000 series of pattern plate, so the product is not strictly used in the anti-rust, such as truck models, cold storage floor. 3, aluminum-magnesium alloy tread plate: 5052 or 5083, such as 5000 series of aluminum as raw material processing, with good corrosion resistance, hardness, anti-rust performance. Usually used in special places, such as ships, cars lights, humid environment, the high hardness of aluminum, a certain load-bearing capacity. This entry was posted in Aluminum Sheet and tagged Aluminum Sheet. Bookmark the permalink.